I often make sprites and one of my recent sprite projects is trying to make a chi chi sprite sheet. I sort of began all over again so for starters here's some sprites of bulma and chi chi in five different perspectives. Haha, nice! I love these!! I've made some similar animations with Mario characters before. Keep on doing what you're doing! The chi chi project is going at a snails pace (partly because it's getting very stale for me). 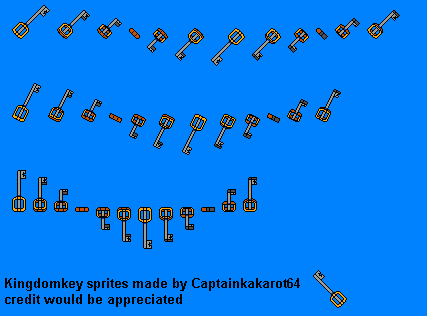 So here's a sprite sheet of my favourite keyblade: the kingdom key. I decided to make a few sprites of random characters that I like.